Although the Parisian footballers have certainly looked just as shocked on the Seine island, this shocking event should not serve as an alibi, if the team of Thomas Tuchel on Wednesday evening in Nantes in the third attempt to finally fix the championship. Prerequisite for this is an away win, which under the current circumstances, however, can by no means be dismissed as a self-starter. Paris St. Germain is currently struggling with major staffing problems that even go so far that the German coach sometimes has trouble filling his matchday squad exclusively with professionals. Almost logically, the undisputed league leaders have twice missed the bag, even mathematically. That between Nantes and PSG, the odds were set on the away win relatively high, is primarily related to the 1: 5 swatter of blue-red-whites at the weekend in Lille. Whether Nantes can play in a similar rush and provide for another surprise, but must be doubted. Because in the catch-up game Nantes vs PSG a prediction on the winner is difficult and numerous eventualities incumbent, seems the recommendation of an alternative betting market obvious. Almost three months ago, the former professional of FC Nantes, Emiliano Sala, crashed on the trip to Cardiff and died. Although it might sound presumptuous, his ex-counterparts from the west of France seem to have not coped well with the loss of the happy attacker. However, the bottom line results after the disaster due solely to the death of Sala, would still be wrong. From the past 13 matches in the French Ligue 1, the Yellow Greens only three wins (two draws, eight defeats). The fact that the team of the experienced Bosnian coach Vahid Halihodzic still does not have to fear for relegation, they have to thank the ordinary first round, in which the previous year’s Ninth collected at least 22 points. With now 34 points, the advantage over the first relegation place seven comfortable nine game points before the end. Under normal circumstances, for the table-15. do not burn anything anymore. 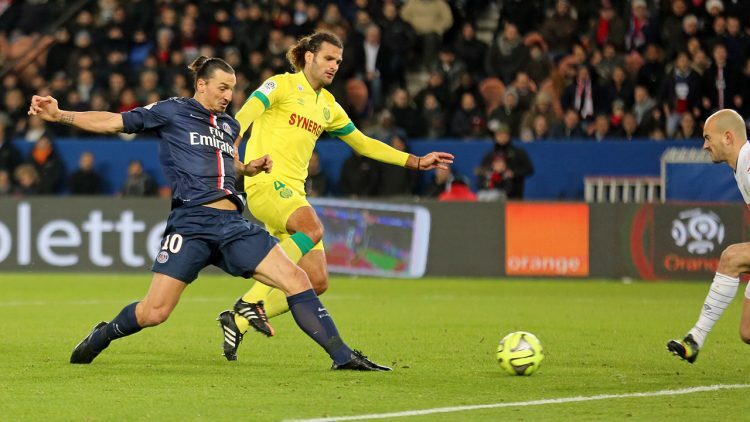 At the weekend, the canaries were a surprise when they defeated Olympique Lyon 2-1 at home. Anthony Limbombe scored the winning goal in the 83rd minute with a direct free-kick. Incidentally, it is not uncommon for FC Nantes that the ball crosses the goal line in the final stages. With ten goals in the final 15 minutes (76th – 90th), “Les Canaris” are one of the most dangerous teams towards the end of the match. Only Paris St. Germain (19) and Olympique Nimes (13) met more often at this stage. On the other hand, the defensive of the Halihodzic-Elf presented from minute 76 but also very vulnerable. Nine of the 41 goals conceded the Romanian goalkeeper Tatarusanu in the final quarter hour. On this knowledge basis, it could well offer, on Wednesday evening at the duel Nantes vs PSG to give a hint that at least one later hit falls. The scores for a goal from minute 76:59 amount to a respectable 1.83. The home record of the Yellow Greens is as positive as the goal difference (26:19) with six wins, four draws and five bankruptcies. Because the eight-time French champions (last 2001) also beat Olympique Marseille (3: 2) or Lyon (2: 1) and Lille (2: 3) and St. Etienne (1: 1) offered a hot dance in front of their home crowd, we would not lean too far on the window and rather forego a Nantes vs PSG prediction towards the favorites. With the exception of Kayembe probably all men are available. There will not be many changes compared to the success of the weekend. If Paris St. Germain had not unexpectedly failed Manchester United in the knockout stages of the UEFA Champions League, the star ensemble from the French capital would have been involved with FC Barcelona on Tuesday night in the round of eight. However, the coaching staff around Thomas Tuchel must be satisfied with an away game in Nantes. The chances that this particular game in the west of the country promises to be special, are not bad at all, because if the blue-red-whites win at the Stade Louis Fonteneau on Wednesday, they would not be able to take the eighth championship in a row. With six more matches to go, PSG would have a 20-point lead over Lille’s “toughest competitor”. But it was the runner-up in Ligue 1 at the weekend that inflicted the biggest defeat on the Sheikh Club in over two years. With 1: 5 the Tuchel-Elf got under the wheels and revealed serious weaknesses in their own defense. The former coach of Borussia Dortmund and Mainz 05 criticized after the match but not his players, but the transfer policy of the club. Tuchel complained that his squad had too few options and he had to set up ailing players to even get a team together. In fact, the (quasi) designated champion lacks in breadth, especially when, as at present, numerous top performers are injured due to injury. Neymar, Di Maria, Cavani and Marquinhos are also not available as the rejected Rabiot. Juan Bernat saw a red card against Lille and thus worsened the staff situation at the table leader. Because Kehrer, Meunier and Thiago Silva are also struggling with health problems, it is still unclear what the team from the capital will look like on Wednesday. In any case, it is a fact that the losses are so difficult to compensate that a subjective prediction on the success of the guests between Nantes and PSG does not seem right. Only two weeks ago, the two teams faced each other in the semi-finals of the French Cup. The favorite prevailed in front of a home crowd in the Prinzenpark with 3: 0, but benefited from two late goals. Kylian Mbappé increased the lead to 85 minutes in the second half before Dani Alves drew up the final (90 ‘). For PSG it was the 17th competitive win in a row against Nantes. In the league, the Tuchel protected did in the first leg 1-0 in the first leg also quite difficult. At first glance, the astonishment is great, if you look at the catch-up Nantes vs PSG looks at the betting odds of bookmakers. Such lucrative odds on the undisputed leaders as on Wednesday evening were rare in the current season. This alone is no reason to bet on the supposed favorites. The Tuchel Elf has to deal with personal problems and will be able to fall back again during the week only on 13 or 14 professionals. The 1: 5 of the weekend in Lille was the receipt for exhausting weeks, in which always had to deliver the same actors on the court. Since we also do not rule out that the Sheikh Club would like to celebrate the championship in front of their home crowd, we advise against giving a tip on the guest triple between Nantes and PSG. Interestingly, the Nantes vs PSG odds on a late hit. Nantes conceded nearly a quarter of all goals this season in the final quarter of an hour, but also netted ten times in the immediate final phase. In that category, Paris St. Germain is the absolute Croesus in Ligue 1 with 19 goals (76th – 90th) and four more stoppages in injury time.